When I’m down in San Diego visiting my parents, I always jump at the chance to bake in their amazing kitchen, and my parents are usually willing guinea pigs. Since it’s stone fruit season, I figured a peach cobbler was the way to go. My mom got caught in the act. 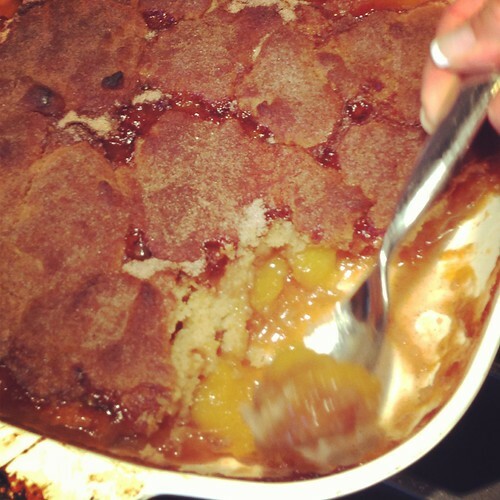 While this cobbler didn’t sway me on cooked peaches, my mom declared it “perfect” and the next day, my dad immediately pulled it out of the fridge to let it come to room temperate as soon as he got home from work. And for you non-cooked fruit eaters like me, the crust topping is the best ever, I think maybe because it’s made with both white and brown sugar. Yeah, I may have picked at the top while everyone else enjoyed the peaches, don’t judge. Finally, here’s an amazing tip that I’m probably the last to know: To easily peel peaches, place one peach at a time in a pot of boiling water, let cool for about a minute, then peel the skin off using your fingers. It’s like magic, and perfect for people like me whose knife skills leave a lot to be desired. 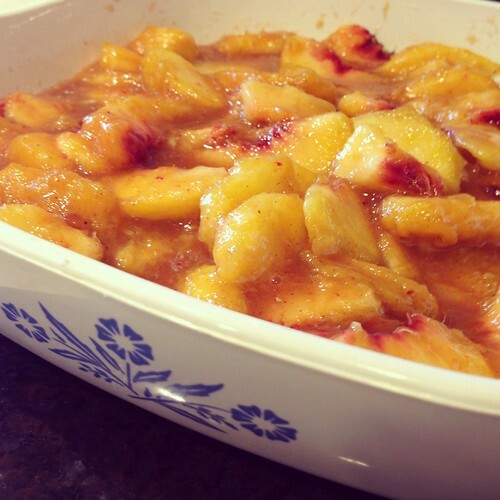 Note: the peaches I used were nowhere near ripe, but they worked beautifully in this cobbler. *You know you’re a food blogger when people ask you that before daring to taste anything, right? Meanwhile, in a large bowl, combine flour, 1/4 cup white sugar, 1/4 cup brown sugar, baking powder, and salt. Blend in butter with your fingertips, or a pastry blender, until mixture resembles coarse meal. Add a few teaspoons of water at a time, until the mixture is just combined. Remove peaches from oven, and drop spoonfuls of topping over them. Sprinkle entire cobbler with the sugar and cinnamon mixture. Bake until topping is golden, about 25-30 minutes.